A restoration project for the riverside portions of the Miller Ranch Open Space in Edwards is set for Thursday, Aug. 23 and Friday, Aug. 24. Volunteers are encouraged to sign up for the restoration session that will be held from 3-6 PM on Friday, August 23rd & 24th. During these sessions volunteers will be able to assist in restoring riparian habitat, consolidating riparian access, and improving their knowledge of river ecology and stewardship. For more information, email Kate Isaacson at isaacson@erwc.org or call 970-827-5406 to sign up. EDWARDS — Miller Ranch Open Space is a 32.5-acre parcel located along the north bank of the Eagle River, which provides access for hiking, mountain biking, fishing and other recreational uses. That area needs some help, and several local nonprofit groups and government agencies will lead a pair of restoration sessions on Thursday, Aug. 23, and Friday, Aug. 24. The open space is a heavily used area and experiences extensive trail braiding, and undirected social trails through a significant portion of the important riverside habitat known as the riparian area. Currently, many of the undirected social trails force open space users to walk through wet and muddy areas, and many of the social trails dead-end, forcing users to backtrack. The undirected social trail network continues to grow, and the resulting compacted soil covers a substantial portion of the riparian area. As a result, unfiltered runoff containing nutrients and sediment enters the Eagle River. The addition of nutrients and sediment in unfiltered runoff threatens aquatic life and ecosystems as a whole. After identifying this threat, Eagle County Open Space, Eagle Valley Land Trust and Eagle River Watershed Council worked together to develop the Miller Ranch Open Space Riverside Restoration Project. This project is a collaborative effort and aims to combat environmental degradation driven by undirected social trail use and improve user experience at the Miller Ranch Open Space. Through improving the trail network, the riparian habitat will improve, thereby improving the users’ experience as well. 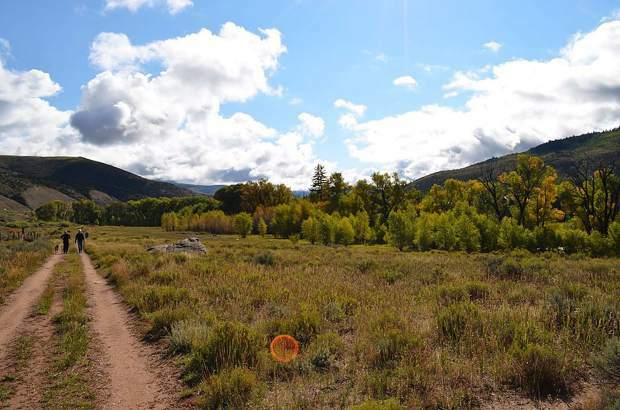 The restoration project will be multifaceted and begin with the revegetation of social trails that are not formally recognized by Eagle County Open Space. A new trail network was developed to provide the greatest enjoyment to the user while limiting riparian habitat degradation. These trails were collaboratively identified with the help of anglers, biologists, Eagle River Watershed Council, Eagle County Open Space and other recreationalists utilizing the open space. Revegetation will be paired with the creation of natural and man-made barriers that deter users from walking through areas that have been revegetated. This collaborative project is open to volunteers of all skill levels, and will provide volunteers with the opportunity to improve riparian habitat while becoming river stewards. Volunteers are encouraged to sign up for the restoration sessions, which will be held from 3 to 6 p.m. on Thursday and Friday. During these sessions volunteers will be able to assist in restoring riparian habitat, consolidate riparian access and improve their knowledge of river ecology and stewardship. For more information, email Kate Isaacson at isaacson@erwc.org or call 970-827-5406.